The Aid and Incentives to Municipalities (AIM) program has been through the wringer this budget season. And as the 2019-20 State Budget continues to be debated at the State Capitol, the $60 million appropriation in AIM funding is one of the issues being negotiated by the State Legislature and the Governor. In the Governor's Executive Budget proposal, AIM funding was eliminated for municipalities that used AIM for less than 2 percent of their local budgets. This was met by strong opposition by counties, towns and villages impacted by this cut. In response to this opposition, the Governor amended his budget and mandated that the counties make the towns and villages whole - using county sales taxes. "This is nothing more than a new $60 million state mandate that homeowners and small businesses will have to finance, while not improving the finances of cities, towns, and villages across the state," said Charles H. Nesbitt, Jr, President of the New York State Association of Counties (NYSAC). Last week, in their one-house budget bills, the State Senate and Assembly restored state funding for AIM, confirming that this program is a state responsibility. 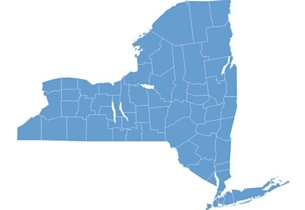 "We commend the Senate and Assembly for recognizing the importance of this state aid program to local governments across the state," said NYSAC Executive Director Stephen J. Acquario. Now it's up to the three branches to agree on how to fund the AIM program in the final State budget. This funding stream is important to towns and villages, but it should not be the responsibility of county taxpayers. "Our State leaders must preserve the AIM funding restorations as outlined by the Senate and Assembly," said Nesbitt. "We urge State lawmakers to continue standing up for local concerns as the final 2019-2020 NYS budget is negotiated. Our counties simply cannot afford another unfunded mandate." Read NYSAC's Fact Sheet on AIM Funding. Learn more about unfunded mandates on NY's counties. Media Contact: Mark LaVigne, Deputy Director, 518-465-1473.